First published in Paul Robeson’s newspaper, Freedom, and composed of a series of conversations between Mildred, a black domestic, and her friend Marge, Like One of the Family is a wry, incisive portrait of working women in Harlem in the 1950’s. Rippling with satire and humor, Mildred’s outspoken accounts vividly capture her white employers’ complacency and condescension—and their startled reactions to a maid who speaks her mind and refuses to exchange dignity for pay. 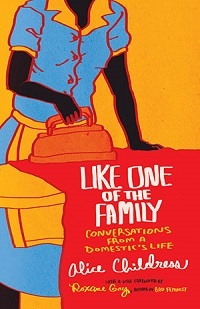 Upon publication the book sparked a critique of working conditions, laying the groundwork for the contemporary domestic worker movement. Although she was critically praised, Childress’s uncompromising politics and unflinching depictions of racism, classism, and sexism relegated her to the fringe of American literature. Like One of the Family has been long overlooked, but this new edition, featuring a foreword by best-selling author Roxane Gay, will introduce Childress to a new generation. What Does Africa Want? Freedom! Why Should I Get Upset? Where Is the Speakin’ Place?